Whether your municipality requires it during a new construction project, or it is needed to control water runoff or help with poorly drained areas of your lawn, a rain garden is a beautiful and practical addition to any yard. A rain garden usually consists of an excavated area ranging from 1 foot to several feet deep. It is filled in with a layering of rock, sand, compost, and mulch. Your lawn may be graded to direct water toward the area, or drainpipes can be installed to bring water toward the garden. Some rain gardens are simple installations, while others are engineered and can be quite extensive. Rain garden plantings can include native grasses, ferns, wildflowers, and select wetland trees and shrubs. A rain garden is designed to collect storm water from hard surfaces such as roof tops, patios, and driveways, and route it into the shallow depression of the garden. The storm water then slowly seeps into the ground, while the sand, compost, soil, and mulch help filter out pollutants and greatly reduce runoff. In addition to preserving clean rainwater, rain gardens reduce the need to water plants during the off season, prevent local flooding, reduce garden maintenance, and are sustainable habitats for native plants. Is a rain garden a requirement for my yard? Some municipalities require a rain garden while others merely require that there be no stagnant water on your property. To find out if your municipality requires a rain garden or not, the best place to look is in the city codes. These can usually be found online through a quick Google search. Within your municipality’s codes look for sections involving minimum building standards or grading and drainage. When in doubt, a quick call, or trip to city hall, should clear up any lingering uncertainty. The two most important things to consider when planning for rain garden installation is a strategic location and choosing plants that are deep rooted and native to your area. When choosing a strategic location, there are three main considerations one should be aware of. The first of these considerations concerns the amount of sunlight that will reach the plants; ideally, the site for the rain garden should provide either full or partial shade. The second consideration, and perhaps the most important, is to ensure that the chosen site is a minimum distance from other structures. Distances vary depending on the structure but they are generally at least five feet from the foundation of the house/garage, the driveway, and/or any utilities; if the house has a basement then at least ten feet away is recommended. If the rain garden is going to be close to a sidewalk or similar structure, the minimum distance is at least three feet. Finally, when planning for rain garden installation, one must ensure that the area is one where water can be directed by either grading or the use of drainpipes. Having chosen the location of your rain garden, your next consideration when planning for its installation are the plants that will be a part of the garden. The best plants for a rain garden are those that are deep rooted and native to your area. Deep rooted plants help ensure that water is retained efficiently. Plants native to the area are essential to any garden because they are already adapted to the area, will require less watering and fertilizer, and are well suited to interact with local birds and insects. One of the great things about rain gardens is that there are a wide variety of plants that thrive in them, such as short flowers, medium height flowers, tall flowers, grasses, and hedges. In addition to the wide variety in height (anywhere from 1 – 10 feet depending on the plant) that flowers that thrive in rain gardens come in, they also come in a variety of colors. The Joe Pye Weed, for example, produces a pink flower and blooms between August and September, while the Wild Senna produces a yellow flower that blooms between July and August. 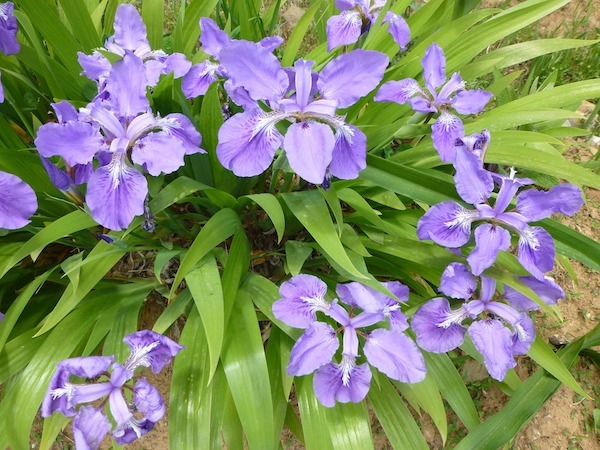 Flowers for a rain garden come in other colors as well such as white (Smooth Penstemon), red (Cardinal Flower), or more regularly, blue and purple (Wild Iris, Monkey Flower, and Dense Blazing Star, to name a few). Whether required by your municipality, a solution to a lawn drainage problem, or simply because you’d like to add a beautiful, eco-friendly, and sustainable garden to your yard, a rain garden is an excellent choice. We love working with clients to design creative and beautiful gardens. Give us a call at (636) 688-6647 to discuss your landscape.